After the success of their last event, the Polaris Jiu-Jitsu Invitational returns to the Indigo at The O2, London. This time we’re looking at a slightly newer format, with contender matches and titles on the line. 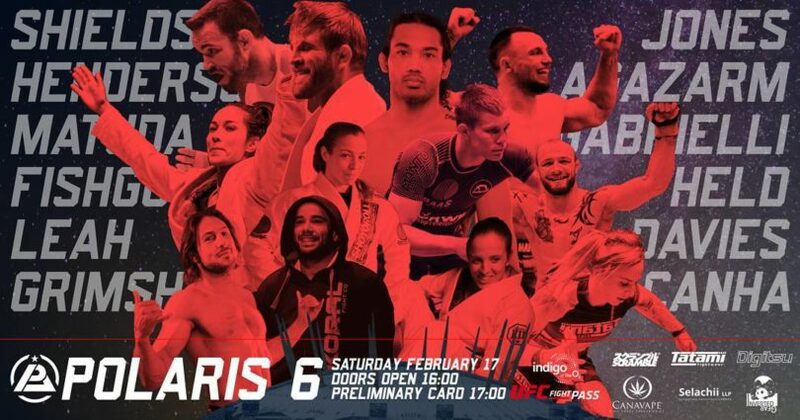 The 6th installation of the world-renowned Jiu-Jitsu event pulls no stops again, with familiar faces, local favourites and big names gracing both the undercard and the main card. With other events leaving female matches by the wayside, Polaris is constantly praised with their healthy mix of male and female action and this card is no different, with 3 fantastic women’s matches on the cards. 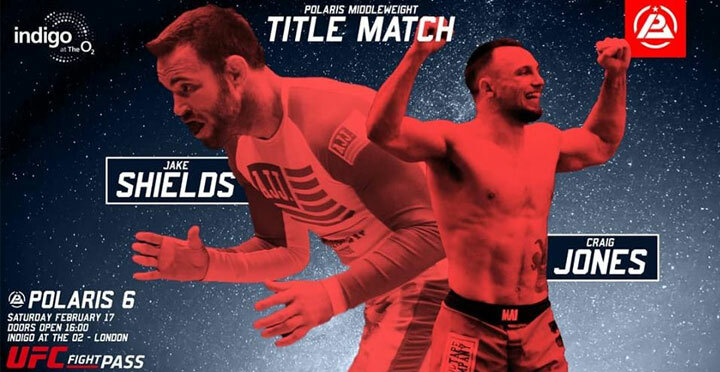 However the 6th event has come under a bit of fire by pushing all of their gi matches to the undercard, while the main event is filled entirely with NoGi matches, perhaps a new format the Polaris matchmakers are experimenting with, due to the success of EBI and their new home at UFC Fightpass. A new addition to the Polaris format is the introduction of the Polaris titles. 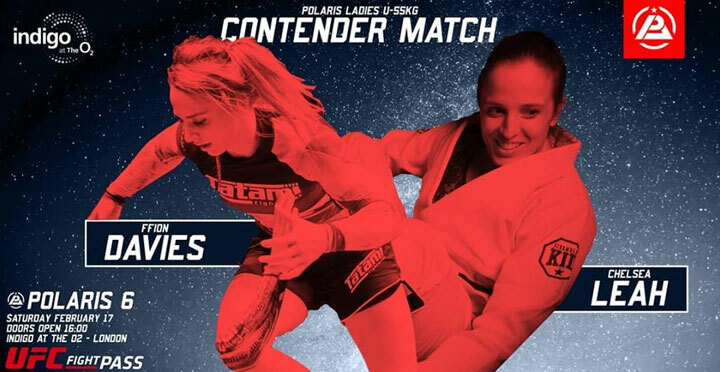 Polaris 6 will see the middleweight title being contented at 83.9kg, and the contender rounds of the female featherweight title being fought at 55kg. The female featherweight winners will meet at Polaris 7, which will happen later this year. 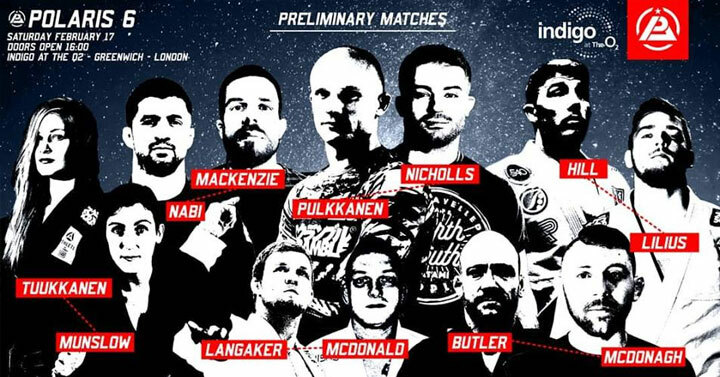 Due to the success of Polaris 5 on UFC Fightpass, they have announced that they will be holding 4 events in 2018, so there will be plenty of action to watch throughout the year, with a variety of different matches happening at each event. Our first match on the undercard features London local Leoni Munslow against the Finnish Emilia Tuukkanen. This is the first time these girls will be gracing the Polaris Stage and both will be out to prove themselves on the night. Both Leoni and Emilia have won numerous titles at Brown belt and are already carving their way through the black belt division. This promises to be an exciting opener to an already exciting Polaris card. The next matchup comes in the form of Roger Gracie Black Belt, Jay Butler and Victor Estima Black Belt, Sean McDonagh. This looks to be a high intensity matchup with both competitors currently making waves on the circuit as fresh black belts. Sean McDonagh has been described as perhaps the best brown belt in the world due to his exciting matches and finishes, while Jay Butler recently won the British NoGi title at black belt. Both fighters were promoted last year so this is an excellent opportunity for them both to get their name out there in the grappling world. Sean says…“I’m super excited for Polaris 6! I’ve been to most of the previous events but only as a spectator so can’t wait to be actually competing this time. Feel very lucky to have been asked to fight on the show having only got my black belt at the end of last year, what a way to make my black belt debut! Finnish newcomer Santeri Lilus is looking to make a name for himself at Polaris against the veteran Bradley Hill. Hailing from Lilius Barnatt BJJ and MMA, Lilus and Hill have met before under different circumstances. They both met at the UAEJJF’s Grand Slam in London, under a 6 minute rule set, which saw Lilus sneek out a win against Hill. As one of Braulio Estima’s most decorated black belts, Bradley will be looking to pile the pressure on Santeri, who is a full-time gym owner and student under Lúcio Lagarto. This looks to be a ripper of a match and one that’s to likely be full of action. Santeri says… “My training is going on good. I actually try not to take any time off from training so i have basically kept on training hard ever since last summer. I try to do about 11-13 trainings a week (BJJ, lifting and sprints). Bradly says… “My training is going very well for Polaris. My camp is a continuation of the training for Braulio’s last superfight in São Paulo, Brazil. The preparation was very tough to get him ready for action and began before Christmas. I have been competing regularly in the run up to my match with Santeri, including this weekend at the National Pro. My intention is always to fight for the submission, regardless of ruleset. I am always excited to perform on the Polaris stage & looking forward to demonstrate my skillset in the Gi. Kicking on from his Europeans result where he subbed Erberth Santos, Norwegian Tommy Lanagaker is going to make Charlie Macdonald work for his win. However, Charlie Macdonald is not push over in the gi, he recently took home silver at this year’s Europeans and is more than capable at defending off any attacks that might come his way. This match is going to be fast-passed, aggressive and one not to be missed. What happens when you’re a Canadian, who gives up the cold winters and green summers, to train full-time in the sweaty, humid gyms of Brazil? 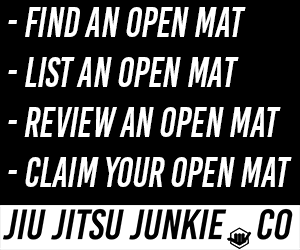 You become a killer like Jake Mackenzie. As one of the world’s top jiu-jitsu competitors takes the Polaris stage, he will have his eyes firmly planted on Yousuf Nabi. Brighton-based Yousuf Nabi, owns and runs Elements Gym full time and is no stranger to the podium steps. He regularly places in the top 3 in some of the worlds top masters divisions, but will age be a factor in this exciting matchup? Tune in and find out! The undercard main event is a match that is more than worthy to be on the headline show. 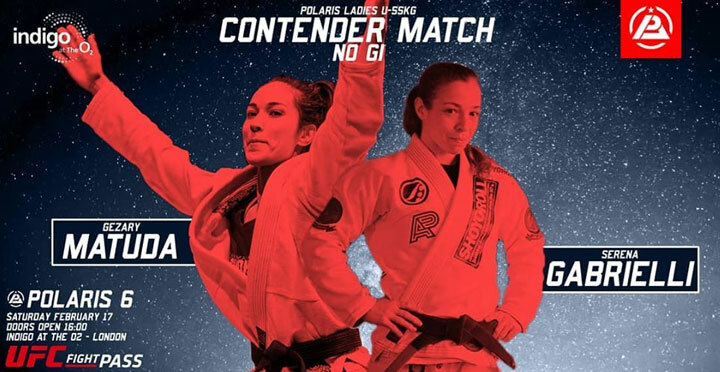 Two Polaris veterans will go face to face in what hopes to be an epic NoGi battle. Both fighters will be coming off of a loss at their last Polaris matches, so they’ll be looking to redeem themselves in at the Indigo. Ross Nicholls, who lost his Polaris 5 match against Oliver Taza, will be looking to push the pace against the Finnish Tommi Pulkkanen. Tommi, who lost his last match at Polaris against Bradley Hill, showed us exactly why his nickname was Spaghetti BJJ, with some novel defences against the heel hook. This match looks to be a footlock fetish’s dream with lots of back and forth action. Tommi says… “Training for the Polaris has been great! I have done most of my training at my home gym Hilti BJJ Lahti, but I have also had a lot of training partners from other academies who are helping me with the preparation. MMA veteran and Team Titan representative Ash Grimshaw goes up against Polaris veteran and Fightzone’s own Marco Canha. Ash Grimshaw is on a 3 win streak in his professional MMA career and he’s looking to take that to the mats against an experienced jiu-jitsu practitioner. Ashleigh… “This is going to be a battle of guts and determination with action aplenty. Both fighters bright their own unique styles to the competition, which will make this an explosive matchup.Training has been going great, this comp is running side by side with my MMA prep for Phoenix in April so it’s been a good motivator. Cage Warriors champion Chris Fishgold, goes up against the Polish destroyer, Marcin Held. Marcin has been away from the Polaris stage but he’s back to redeem himself over his loss to Garry Tonon at Polaris 1. Both are veteran MMA fighters, so this will truly be a match of wills, wrestling and heel hooks. Their combined MMA record sees an impressive 20wins by submission so you know both fighters are going to be game to get the win by submission. The first of our title contender matches will be fought by Darragh O’conaill brown belt Ffion Davies and Andre Galvao black belt Chelsea Leah. Both fighters are no stranger to the top step of the podium, and while this will be Chelsea’s first Polaris outing, this will be 2nd time around for Ffion after her convincing win at Polaris 5. This match favours both in different way, Chelsea brings her black belt pedigree to the table, while Ffion brings her Welsh following and big stage experience to the party. Whoever wins this will go on to face the winner of Gezary Matuda vs Serena Gabrielli. Chelsea says…“My preparations have been great, it’s been amazing having Tom’s support full time. I got the plague that’s been going around since I’m not used to these British bugs, but I’ve been blown away by the support I’ve gotten from my friends around Europe. I even got to go to Rome to train with Serena last week, which was a great experience. Honestly, I’m just so astonished by how helpful everyone has been and I’m thankful that people have been welcoming and accommodating. When Gezary Matuda first came on to the Polaris scene, her 15 second armbar against Michelle Nicolini cemented her legacy as one of the world’s best female grapplers. Gezary has been spending her camp with former UFC straw weight champion Joanna Jedrzejczyk ahead of her fight against Rose Namajunas, but that doesn’t mean she’s been neglecting her own practice. While you would normally see both fighters in the gi, this match promises to be just as exciting without one. 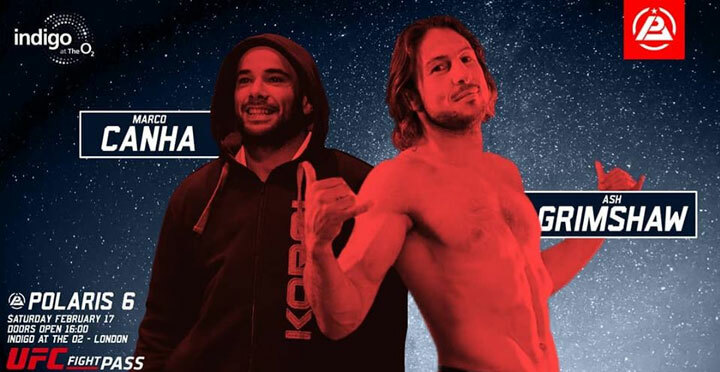 Both are deadly finishers, with Gazary’s trademark armbars and Gabrielli’s backtakes, there is sure to be lots of back and forth action in this matchup. Whoever wins this match will go on to fight for the female 55kg title at Polaris 7. Serena says… “When I was contacted by Polaris pro I was super excited to compete against one of the best jiu jitsu athletes. It was just one week before European Championship, so when I came back I started to train as much as I can nogi. In order of that my coach (Andrea Verdemare) added some extra classes to focus on it and let Chelsea Leah come to train with me to help me. Will Benson be chewing on his trademark tooth pick? Will AJ get another plastic foot thrown at him? Whatever people are saying, they can all agree on one thing. This is going to be an absolute barn burner. 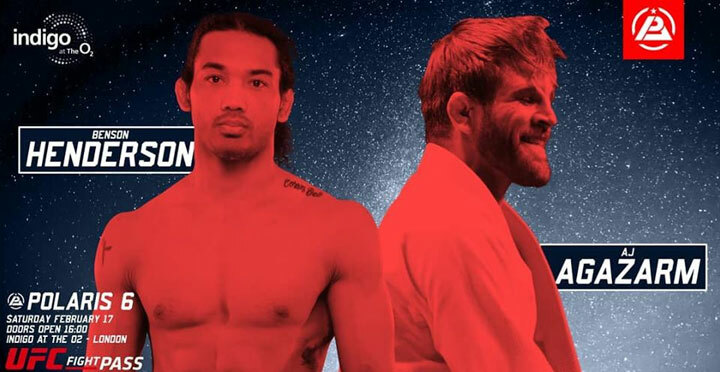 Full time grappler and Gracie Barra representative AJ Agazarm will be seeking revenge for his judge’s decision loss against Benson Henderson after their tumbling match at Fight To Win Pro 37. This time the rules will be for the longer Polaris format, and unusually AJ has been keeping quiet on the social media smack talking this time. 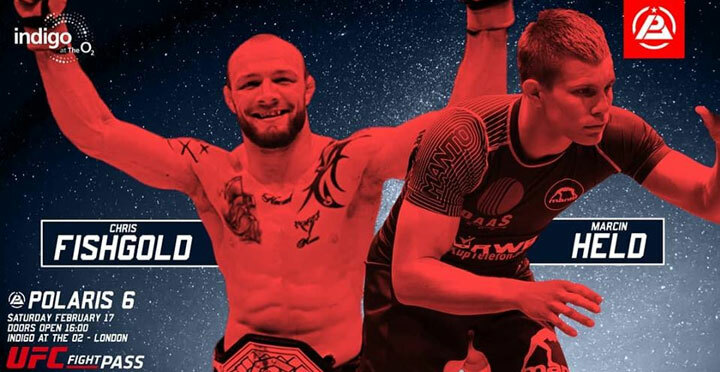 The crowning glory of Polaris 6 will come in the form of grappling’s rising talent Craig Jones squaring off against MMA veteran, Polaris veteran and Danaher Death Squad member Jake Shields. This match will be for the Polaris Middleweight title, where both fighters will be squaring off for the gold. Craig Jones had an absolute stellar 2017, where he beat Leandro Lo and Murilo Santana on the same day. He also tore through the EBI absolute division, winning every single match by submission, only to narrowly lose to Jake Shields’ teammate Gordon Ryan. We know that both fighters will be down to scrap, but who will take home the gold? Well you’ll need to buy tickets on the Polaris website, or subscribe to UFC Fightpass to find out.